Why Do People Live in Leiper's Fork? Leiper's Fork is a historic village located within rural Franklin TN. You will find a variety of homes here from small one-levels to large estates with horse property. Much of Leiper's Fork is protected by a Land Trust making Leiper's Fork the most desirable land available within Williamson County. Many country music stars call Leiper's Fork home. With the availability of unique homes and large acreage it's easy to see why residents aspire to live here. What's the Leiper's Fork Area Like? Leiper's Fork is a small community within a community. The village of Leiper's Fork is lined with art galleries, shops and eateries. Many tourists visit this location to catch a glimpse of Vince Gill or Keith Urban and Nicole Kidman but the locals come here for the laid back living and small, tightly-knit community. Leiper's Fork hosts a variety of events each year that draws people from near and far. There are miles and miles of rolling hills laced with horses and cattle. Making it a favorite Sunday drive location. What Type of Activities are Nearby? Leiper's Fork provides the peace and tranquility of the countryside while just being a short drive to Nashville and Franklin. 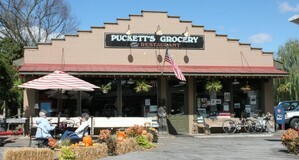 However, you will find some of the best art galleries and the well-known Puckett's Grocery located within Leiper's Fork. During the summer the Lawn Chair Theater hosts outdoor movie presentations. But don't be surprised to see some of it's famous residents hosting an impromptu concert some night. What Schools Do Leiper's Fork Students Attend? Leiper's Fork homes for sale in Franklin TN is served by Williamson County Schools. Students attend Hillsboro Elementary and Middle School and Independence High School. Williamson County Schools are ranked number one in the state and in the top 1,000 districts in the country. Much of land surrounding the small historic village is protected by a Land Trust. This was developed to keep acreage from being sold off to high-density housing developments. It is one of the reasons many people choose to make Leiper's Fork their home. Let Us Help You Find Your Leiper's Fork Home. Many believe Leiper's Fork is a small town but it is actually within the 37064 zip code of Franklin TN. This makes it especially difficult to find homes in Leiper's Fork as it is referred to as a subdivision in the Middle Tennessee MLS. That's why it is so important to use a Buyer's Agent when looking to purchase homes here. Below is a complete list of the Leiper's Fork homes for sale in Franklin TN. This list is updated daily so it is the most accurate place to find a Leiper's Fork home. When you are ready to work with a Buyer's Agent, call Franklin Homes Realty LLC at (615) 495-0752. Interested in Leiper's Fork lots for sale, click the link to be taken to the entire list of lots available.